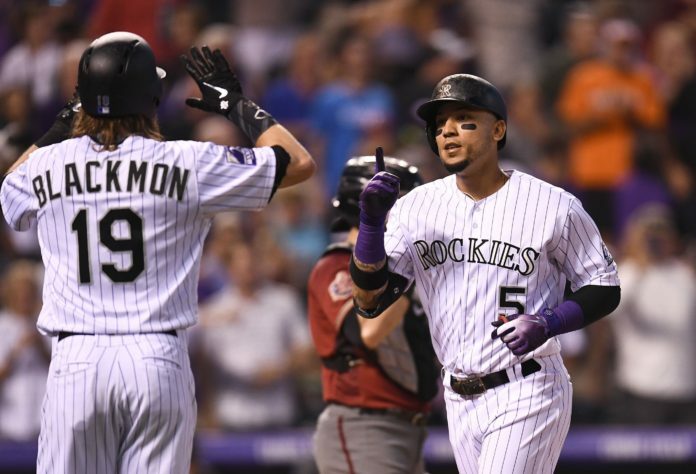 The Colorado Rockies leveled the Arizona Diamondbacks Wednesday night, 19-2. The victory was the most dominant of the season for the Rockies who are now 47-45 on the year. Despite losing, Arizona had a lead early in the game when Paul Goldschmidt launched a solo home run to left field in the first inning off of Rockies’ starting pitcher German Marquez. The Rockies answered quickly as D.J. LeMahieu worked a walk to lead off the bottom of the first inning for Colorado. Charlie Blackmon followed with a single which was compounded by an RBI single from Nolan Arenado to tie the game. Carlos Gonzalez then grounded into a fielder’s choice, which scored another run for the Rockies. Later in the inning, Ian Desmond blasted a three-run home run to push Colorado ahead 5-1 after the first frame. Outside of the home run he surrendered in the first inning, Marquez was dominant on the mound. Carlos Gonzalez plated another run for the Rockies in the bottom of the second inning as he grounded into another fielder’s choice. Desmond later hit an RBI single to right field. Colorado scored another run in the inning when Jorge De La Rosa balked on the mound which forced home another run for the Rox to extend their lead to 9-1. Colorado did not slow down in the third inning as Blackmon smashed a two-run homer to center field with Gonzalez later hitting a solo shot, himself, in the inning. And it just kept going from there. 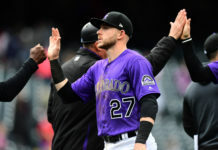 The Rockies added more runs in the fourth inning when Marquez helped himself out by hitting an RBI single to score Tony Wolters who reached base on a triple. Blackmon then drove home a run with an RBI single, which was duplicated by Arenado. Gonzalez then hit another solo home run to make the score 18-1. Marquez put a bow on his night by hitting a solo homer in the fifth inning to score run No. 19 of the game for Colorado. Marquez finished with a line of six innings pitched, allowing two runs on five hits while striking out eight batters. He also hit a 447 bomb. Wednesday marked the 8th time in club history Colorado scored 19 or more runs in a game. Arizona manufactured a run in the 6th inning but were held to six hits total on the evening. The 19-run performance was one for the record books as LeMahieu, Blackmon, and Gonzalez each scored career-highs with four runs each. It was the first time in franchise history that three Rockies scored at least four runs in the same game, per Rockies PR. The Rockies and Diamondbacks will conclude their series Thursday at Coors Field with first pitch set for 1:10 MST.